Mahendra Singh Dhoni is a name that needs no further introduction to the average Indian who hasn’t been living under a rock the past decade, . As a cricketer, he has defined the current generation of the national team bringing success, a change in the attitude and the game. His contributions -as captain as wicket keeper and a swashbuckling batsman has put his name up with the all time greats of Indian cricket. Director Neeraj Pandey had no easy task when he set out to tell the story of the calm, small town lad who made the world sit up and take notice. MS Dhoni – The untold story sets out to trace captain cool’s story, from his childhood growing up as the son of a humble pump operator culminating in the historic innings he played at the Wankhede Stadium – a match winning effort at the biggest stage of all, the world cup finals. The film starts strongly, setting the premise of how a talented young boy and his motley bunch of friends dream big. 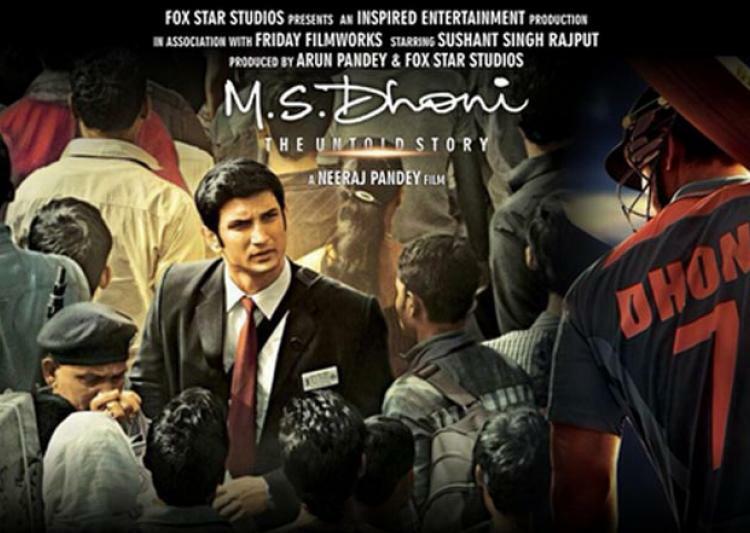 Anupam Kher as Paan Singh Dhoni does a brilliant job of portraying the average middle class Indian who believes that only studies will lead to job security and thus a “successful” life. Neeta Mohindra is quite convincing as the doting, supportive mother. 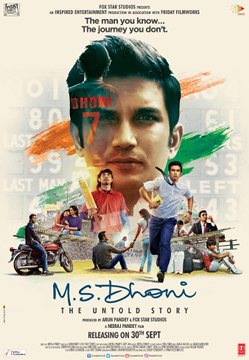 The peppy soundtrack and the difficult circumstances of Dhoni’s early career before his international debut carry the first half of the film beautifully. That’s when things begin to go sideways as the movie seems to get away from director Neeraj Pandey and editor Shree Narayan Singh. Although we did sign up to see “the untold story”, the various song sequences seem forced, unnecessary and too long. The leading ladies look fresh but completely out of their depths as the story does not do justice to their individual lives. You do get the classic Bollywood treatment of a blossoming romance where you see our man and his lady perched on rocky outcrops in stunning locales. You can expect the feminist brigade up in arms about the handling of the relationship between Mr and eventually Mrs Dhoni. Too many facets of the story vie for attention and pivotal moments in his life, his ascension to Captain of the t20 team for example, do not find a mention. If you’re expecting a close, behind-the-scenes look into the private life of the man, then be prepared to be disappointed as the director maintains a respectful distance from getting too involved with the details. Dhoni did step on some big toes and polarised the cricketing fandom with some of his decisions but director Pandey gives that a wide berth, probably a good move after what happened to Harsha Bhogle. Thanks to the generosity of BCCI and the other archives, the audience are treated to some lovely visuals of some of the best shots that Dhoni has played. Sushant Singh Rajput has done a fabulous job of emulating the very familiar expression and body language of the man himself. With a total run time of 3 hours and 10 minutes, it’s almost a chore at the end with some thoughtful re creation of commentary by Ravi Shastri. Cricket lovers however, will immediately recognize that those were not the words that played over on that fateful night in 2011. To the die-hard fan, MS Dhoni – The untold story is definitely worth watching once, to re live the meteoric rise of India’s most successful captain and to celebrate his career and persona. However, you do come out of the theatre feeling like you’ve been served a little overdose of cheese on the pizza. Sometimes, the regular thin crust would work just fine, as the cheese tends to smother the other flavours.